“Feast on positivity, cause you’re going to get pounded with negativity every step of the way while you build your business.” is one standout quote from Inc.’s recent interview with Infusionsoft CEO, Clate Mask. The interview is part of Inc.’s Seriously Amazing Entrepreneurs series, and also ties in with the 15th anniversary of Infusionsoft’s launch. While a title like Seriously Amazing Entrepreneurs could seem like a cliche’ or throw-away term to some, it’s pretty fitting for Clate and his work. Infusionsoft has genuinely set the bar and created an entire ecosystem for automation, customer relations and email marketing. There are many current email programs, automation tools and best-practices guides that owe their entire philosophy to what Clate and Infusionsoft have created. This wasn’t plagiarism or idea stealing; instead, it’s because Infusionsoft popularized a lot of what we consider “best practices” in marketing today. When reading Clate and Inc.’s interview, you’ll find plenty of wisdom centered around Infusionsoft, but we bet you can apply it to your company, life or even your daily routine. However, it’s not all Infusionsoft based, there’s lots of great insight on personal development and general entrepreneurship. Improving yourself and your brand are strongly tied together . More of our favorite quotes are below, and you can read the entire article right here. And if you want hands-on help on your next Infusionsoft campaign, check us out at: https://7figureautomation.com. Video is a powerful marketing tool that demands full time-bound attention from your audience. From explainer videos to creative video ads, more marketers are using video marketing today. People are more perceptive to marketing videos than text and image based content. In fact, the word video increases open rates by up to 19% in email subject lines. That’s a cute little piece of statistics for entrepreneurs and online marketers. Advancement in internet infrastructure has dramatically improved connection speeds, allowing seamless streaming of HD web video on both desktop and mobile. Video is now a necessary form of engagement for big brands and small businesses alike. This video marketing guide outlines the benefits that your business can reap by taking advantage of this highly interactive form of marketing. There are multiple benefits in well done video marketing. Reading text is an active experience where you have to choose your speed, and take in the content at your own pace. It’s easy for your audience to skim through text and decide which sections they are interested in. But video gives users little freedom in terms of consumption. You either watch a full video, or you lose attention somewhere along the way and stop watching. Watching video is a passive experience. When someone hits the play button, they have given their consent to be shown something. They don’t have to dig in themselves or ‘skim’ through the content like you’d do with text and image based content. This way, video tends to be more engaging. More so, the amount of information that can be shown in 1 second worth of video content is much more than what can be read in the same span of time. By creating videos that achieve an instant emotional engagement, marketers can foster engagement and thus increase conversions. Since a video is more interactive and personalized, it’s great for branding. Viewers can recreate the experience of being face to face with someone, much better than with image, text and audio. Using video marketing, you can show the human side of your business through physical and verbal expression. Online video is also an effective and cost-friendly way to indicate professionalism and brand quality. If your business has the time and skills to produce high-quality video, then it will be perceived as being a legitimate organization with a genuine interest to provide a great service. Google sometimes inserts thumbnail images in their search engine results pages (SERPs) for web pages that contain videos. Such results tend to attract higher click-through rates as compared to standard web page results. This demonstrates how ‘video rich snippets’ can be a superb way to increase traffic to a particular website. Marketers can draw more traffic from the SERPs by including video in their content and implementing respective technical mark-ups. Links are a core metric through which search engines determine the authority of a website or webpage. Pages that contain mixed media types (text, images and video) tend to generate more inbound links than plain text or image-text-only pages. By including video in your website content, you increase the probability that other blogs and web pages from around the web will link to it. Since video content increases engagement and trust, it’s an excellent way to drive better conversions, especially on commercial pages. Nowadays, videos have become extremely popular in the e-commerce world. People will be more convinced to buy a product if they have seen a video in which the product is featured. Use video to increase conversions in any of your lead generation or sales pages. After Google, YouTube is the second largest search engine in the world. It is important to cultivate a presence on the most popular video marketing platforms (YouTube and Vimeo). Just like it helps to rank on Google, you also want to rank on these video platforms, towards increasing brand awareness, sales, and referrals. Video is an integration of text, image and music towards a common goal. Most marketers make the mistake of thinking of video as merely a type of content. To create a video, you need to start with an idea. If you find yourself converting content into a video, then it’s an indication things have gone awry in your creative marketing process. Answer the following questions to validate your video creation. Would this content lose something if it was just text and image? Have it in mind that the effectiveness of your video marketing campaign depends on the ability of your video content to create an instant emotional connection. If your video wouldn’t lose anything if it was just text and image (like with a typical blog post), then this is an indication it’s not the right fit for your video marketing campaign! Does the idea require aesthetic and conceptual engagement? If the idea/content you have in mind requires a visual element in order to be interesting – this is an indication that it could work as a video. On the other hand, if you realize that you’re including the visuals as an afterthought, then this is an indication that the idea is not optimal for a video. It takes a lot of time and effort to create a top-notch, viral video. A great video is determined at the planning stage before production starts. Follow this 3-point approach every time you have to produce a marketing video. o Plan – video marketing should be just one facet in your overall marketing plan. Think of it as an engagement tactic that’s meant to support your key goals. Whether you are looking to increase brand awareness or boost conversions, think about what your main goals are. These should guide the creative process of coming up with ideas for a suitable video. o Produce – once you have a verified idea (using the two questions above), it’s time to create your video. This is where you think about who your target audience are. You also need to think about your production budget. Video production costs vary from a few hundred to tens of thousands of dollars, depending on the kind of content and quality you’re looking for. If you can’t produce the video yourself, find a freelancer or company that will bring your idea to life. o Promote – if you created a great video already, this should be easy. People are going to share a video that they think is awesome. Focus on where your target audience hangs out, and show them your content. Think Twitter, Facebook, LinkedIn, YouTube, and Google+. This informative guide equips you to get started with video marketing. 45.4% of all internet users watch at least one video in a month. There’s no reason why you shouldn’t be making use of video marketing to advance your business interests. YouTube is no doubt the world’s most popular video marketing platform. If you are serious about leaving no stones unturned in your marketing, you’ve got to take a shot at every opportunity that comes your way. Facebook video Ads are a new but powerful tool that you can use to reach out to your prospects in an engaging way. Statistics suggest that Facebook video Ads are catching up (if not already outdoing) YouTube video ads, when it comes to the total number of monthly views on both mobile and desktop. Especially if you know how to create killer video ads. Get started by planning your video creation.. Have a plan in advance to increase the probability that you’ll come out looking good. What do you want to create a video about? What theme do you want your message to convey to your audience? Half the work will be done once you can answer all these questions. The next step is to write a script. Simply write down what you want to say, bearing in mind how you’re going to say it, and what text or graphics you’re going to need to accompany it. Shorter is better. If you can’t work your way around a solid script, consider hiring a freelancer to do it for you on Upwork or Fiverr.com. Facebook makes it easy and possible for you to create video advertising campaigns. Simply login to your advertising manager and click on “Create Ad” from the top right corner of your screen. In the screen that appears, click “Get Video Views”. Select which page you want to promote with your Video Ads. Set up the campaign name and select your target demographics. Facebook’s hyper-surgical targeting features make this super easy for you. You can narrow down your audience based on custom audiences, locations, age, gender, language, interests or behaviors. After your campaign has been successfully set up, it’s time to include some textual description and call to action for your Facebook video ad. The Text field gives you an opportunity to write something compelling about what you’re promoting. Also, select a call to action that will be visible to customers when they’re watching the video. You can create Facebook video Ads using the Power Editor. This is however a somewhat more complex route…but the best option if you’re looking to create different variations of your video ad for split testing purposes. Login to your Facebook Ad Manager and select the “Power Editor” menu option. Download your Advertising account data into the Power Editor tool. You’ll be able to sort your data by campaign, then create a new campaign altogether. In the “Create Campaign” screen, enter the name of your new campaign, select buying type and then choose “Video Views” from the Objective drop down field. Switch to the ad set view in the next dialog and then create a new ad set for your video ads. Ad sets are groups of ads that target a particular group of people. The more you segment your ad sets, the easier it’s going to be for you to analyze the target level results of your campaign. Once you have set up your ad set, switch from campaign view to the ad set view in Power Editor’s vertical menu. Pick the ad set you created above and then select the Ads tab at the top area of your screen. You’ll be able to create a new ad from the screen that shows. Select the page you intend to promote, enter compelling text telling people what you’re promoting, then upload your video. You’ll also specify a call to action in this last step. Use the 3-second Rule – Facebook recently introduced the autoplay feature, which automatically plays videos and then stops immediately people scroll past it. What does this imply? You just have 3 seconds to capture your audience’s attention. So make sure that your video’s start is compelling and attention grabbing. It’s also important to note that Facebook defines a “Video View” as a view extending for three seconds or more. Thus, your first 3 seconds make great sense from a metric standpoint. Keep it quiet – Facebook’s autoplay feature is designed to make each video play without a sound as people scroll down their feed. This means that your business should focus on the visual message. Focus on making what users see during those first 3 seconds as engaging as possible, without relying on sound. Flexibility counts – Facebook’s hyper targeting features give you a lot of credibility – use it! Try out specific segments and see what works for you. If one of the Facebook video ads that you had high hopes in isn’t performing, drop it and create a better one. Make it real – the best-performing Facebook video ads tend to focus on user engagement and the story, as opposed to explicit sales gimmicks. Focus on cultivating that unique experience that will make users click right off the bat. Customer comes first – Facebook’s power targeting lets you reach out to the right people with a message that’s fine-tuned to their needs and motivations. Make sure that your video ads stay true to your customers. Your message should resonate with the situation your audience is currently facing. Once your video ads are up and running, you’ll want to step back and look at how things are going? Think about your KPIs. How many conversions have you got since you started running these video ads? Did you have a bounce rate problem? How many shares, likes, comments and other marks of engagement did you get? Did your Facebook video ads reach out to as many people as you wanted? Asking these questions helps you improve your campaign so that you get better results. Drop what doesn’t work, focus on what works. Make your ads better with each iteration! Facebook video marketing harbors a lot of potential for your business. You’re leaving a lot of money on the table if you’re not making use of Facebook video ads to boost your brand and products! Do you know what’s the easiest way to find your target audience and get them to engage with your marketing campaigns? You can deploy the full power of Facebook marketing by collecting intelligence on your fans and prospects! One of the best things about Facebook Audience Insights is that it’s free to use and can be a generous source of behavioral and demographic data on your audiences and competitors. You want precision targeting for your business ad campaigns, right? You have a useful tool right under your nose that can be used to create highly targeted ads that reach out to your specific prospects! The massive data you get from Facebook Audience Insights can also come in handy when you’re creating a buyer persona for your service or products, or when you want to improve your website content so that it’s right on the bull’s eye. Keep reading to learn how to better understand your audience and optimize your Facebook marketing results. Simply navigate to your Facebook Ads Manager dashboard then click on ‘Tools’ and then click on ‘Audience Insights’ in the drop-down menu. Everyone on Facebook – this is the general audience. Gives an overview of the entire Facebook (by default U.S. Facebook audience). Go for this option if you’re looking to dig data on competitor pages or broad audiences. People Connected to Your Page – makes it possible for you to access data related to your Facebook page. If you manage multiple Facebook pages, you’ll get an option to choose the page you want to focus on right now. This is the way to go if you’re looking to better understand your audience. A Custom Audience – this is a somewhat complex option for entrepreneurs who’re already using Facebook Custom Audiences. You’d need to upload a list of email addresses to create a Custom Audience. Once done, Facebook compares these emails to respective user accounts to surface the data you’re interested in. If you’re just a beginner, it is recommendable that you forego custom audiences. However, if you have a lot of customer data available, this option gives you a powerful tool to understand behaviors and demographics for the folks who’re already using your brand. Once you have selected an audience above, it’s time to zero in onto the details. Leave this field blank to scope on customers from across the world. Feel free to play with the location setting based on what specifically you’re looking for! Now that you have narrowed down your audience in terms of location, you can go right ahead to create a segment based on age, interests, gender, people connected to your page or advanced data such as language, behavior, education, work, etc. We like to think of the Interests option as a massive way to reveal priced information on competitors and the industry in general. Just type down your Competitor’s Facebook to search for it. There’s no telling whether or not it’ll show up, and it’s hard to figure out what algorithmic logic Facebook uses to determine what page shows up and what doesn’t. Just have a list of competitor pages and group interests that describe the audience you want to get data on, and then type them into this box. If you are focusing on the U.S. audience, two additional tabs (Household and Purchases) are also available. Easily use the data you pull from your Facebook Audience Insights dashboard to make your posts more effective and on-target. These are all important details that help you understand your customer better. Facebook’s graphical presentation approach makes it easy for you to make sense out of all this information. For instance, you can automatically see the percentage of your audience who are women! Facebook Audience Insights provides valuable lifestyle data that creates mini-personas based on brand affinity, interests, demographic data and other factors. These personas happen to be quite broad, but they lay the foundation for a clearer picture regarding who your audience is. They give you a window of opportunity to picture the lives of your audience. To get into their shoes so you can understand their needs and motivations. A good understanding of your audience personas helps you with framing. Adjust the timeframe of your marketing to coincide with certain important events. If you are a travel company and knows that most of your audience travels for holiday during a certain month, then you can concentrate your advertising and promotions throughout that month. At 7 Figure Automation, we like to think that the demographic information as interesting, but it’s nothing close to what you find under “Page Likes” tab. Learn a lot about your audience based on the kind of Facebook pages they like. This Facebook audience insights tab gives you a detailed view into their interest breakdown. It comprises the top pages your audience have liked in each category, and the Facebook pages that are most relevant to your audience. Through this combined data, you can piece together a more accurate persona. You know what apps your audience uses, what organizations they support, what political affiliations they belong to and what media outlets they follow. Bury yourself in this data to get a clearer perspective of your audience. Add this to what you learn from Lifestyle data and answer any questions you might be having about your customers! Each blank you fill is another opportunity to create more targeted content, and set up more effective ads! This section is a goldmine of information regarding how your audience segment is most likely to engage content on Facebook. You can see how likely it is that the segment will like, comment on or share your posts, access their accounts or click on your ads. This way, you can play with the segment filters to find a target audience that’s more active and more likely to engage with your content. You also learn what devices your customers are using to log in to Facebook. It’s almost always mobile, so make sure that your content and promotions are optimized for that. Figuring out how people are engaging and interacting with your content can tell you a lot about their mindset. But researching your audience is unavoidable because you must put the right message in front of the right people…at the right time. Different parts of your target audience have different interests. Facebook Audience Insights helps you master your audience in terms of their lifestyle, social activity level and interests. By leveraging this behavioral and demographic intelligence, you can optimize your organic and paid social media campaigns to yield the best results! Get started with Facebook Audience Insights – and grow your business’s engagement by figuring out who is most responsive to your brand. Mental toughness is a valuable skill in today’s challenging world. Most people know how to build physical strength – but there’s a lot more ambiguity when it comes to building mental strength. Your thoughts have powerful influence over what you feel and how you behave. In fact, scientists at the Laboratory of Neuro Imaging estimate humans have about 70,000 thoughts per day. That means you have 70,000 opportunities to think optimistically or tear yourself down. As mentioned earlier, our thoughts have powerful influence over what we feel and how we behave. In fact, your inner monologue has a tendency to become a self-fulfilling prophecy. Thinking things like, “I will never get this business profitable,” or “Things never work out for me,” can alter your behavior in a way that makes those predictions come true. Replace these negative thoughts with optimistic ones. When you notice yourself thinking something like, “I can’t figure this out,” remind yourself that your thoughts aren’t necessarily true. Instead, ask yourself, “What would I have to believe in order to make this happen?” Then, focus on what you can do instead of what you can’t. Allowing emotions to control your focus drains your will power. Emotions are nothing more than actions signals. These signals are telling you that something needs to change. If you are frustrated it’s because your current strategy isn’t going to get you to your goal – you need to change your approach. If you are fearful about your presentation at the big conference – you need to prepare yourself to give an exceptional presentation. Many emotional issues stem from a desire to avoid discomfort. People who fear failure often avoid new challenges in order to keep their anxiety at bay. But, avoiding emotional discomfort is usually a short-term solution that leads to long-term problems. Develop an awareness of how your emotions impact your focus. And decide to be in control of your emotions, so that they don’t control you. Face uncomfortable feelings head-on and take charge of your focus. Embracing discomfort will give you more confidence and you’ll gain the ability to face new challenges. It’s impossible to feel mentally tough when you’re focused on circumstances you cannot control. Your life doesn’t just “happen.” It is designed by you, whether you know it or not. The choices, after all, are yours. You choose happiness. You choose sadness. You choose decisiveness. You choose ambivalence. You choose success. You choose failure. Just remember that every moment, every situation, provides a new choice. It gives you a perfect opportunity to do things differently to produce more positive results. Everyone has the ability to be mentally tough. But developing mental toughness requires resilience and optimistic thinking. With focus, you’ll develop the awareness needed to regulate your thoughts, control your emotions, and behave productively despite your circumstances. Learning how to flex your mental muscles is the key to reaching your greatest potential in life. Whether your goal is to become a professional athlete or a successful entrepreneur, or an outstanding parent – mental strength will help you achieve your goal. Using video strategy in your business is considered par for the course because your competition is already benefiting from this valuable tool. That’s why you need leverage from the best video marketing tools available to give your marketing the boost it desperately needs! Here’s a roundup of the ultimate video marketing tools and resources that’ll help you create viral videos to take your business to the next level. Google’s Keyword Planner is an instrumental tool for building new search network campaigns (on both YouTube AND Google), and optimizing existing ones. The best thing about the Google AdWords Keyword Planner is that you are able to search for new keywords and use historical search data to come up with a useful list of search phrases. This free tool helps you come up with keywords that reflect what your customers are looking for, allowing you to create video marketing content that’s timely and valuable! VideoCents helps you find the right keywords for your videos and shows you YouTube video data for your competition. Use this tool to find the right keywords to scale your channel. You get to access search volume data for keywords and phrases that will help you boost your channel’s popularity. This makes it easier for you to target high-traffic niches where you can maximize your viewership. Use VideoCents to maximize your video strategy right from day one. Keynote for Mac is your ultimate presentation tool. If you’re looking to use a presentation in your marketing videos, this tool provides a wealth of beautiful presentations, powerful tools and dazzling effects that you can use to bring your ideas to life. Keynote works for Mac and iOS devices, and there’s a minimal learning curve especially if you’re already good with Microsoft PowerPoint. Microsoft Office PowerPoint is an alternative tool for Keynote for Mac (highlighted above). Use this flexible and powerful tool to create dazzling presentations. You get to access and leverage dozens of pre-existing styles and designs! Animated videos are 150% more effective than ordinary marketing videos! PowToon is your ultimate video marketing tool for creating beautiful animated videos. PowToon makes it possible for you to save money, increase engagement, boost SEO and stand out from the crowd with creative video marketing. This video tool is a must-have, particularly for trainers and educators! Use this tool to create screen recorded videos in a snap. Camtasia is a powerful, easy-to-use screen recorder for PC and Mac users that makes it easy to create fantastic videos without having to be a video pro. Record your screen actions and movements, and import HD video from cameras and other sources. Camtasia is cross platform, so you can use it both on Windows and Mac. ScreenFlow is an incredible video marketing tool for Mac users that takes screen casting to a whole new level. ScreenFlow not only lets you capture high quality videos, but also provides you with an easy-to-use editing interface. You can use a number of motion, editing and media management tools that make screen casting a heck of a lot easier! Audio-Technica is a handheld dynamic microphone with USB digital output, and an analogue output (XLR). The analog output connects to your audio system, while the USB output connects to your laptop, Mac or PC for digital recording. This useful audio recording tool gives you an extended, smooth response that’s ideal for home studio recording, podcasting, voice over, on-stage use, and field recording. Need a cool stand for your video marketing microphone? The Neewer Arm Stand is your best bet. This accessory is foldable, adjustable and convenient to carry. You can change the height or angle to capture your best voice. It can be mounted on the announcers’ table with a Table mounting clamp that is included with the product. If you’re an iPhone fanatic, you may find the latest smartphone by Apple particularly useful. The iPhone 6 isn’t just bigger, it’s much better. Some of the most popular YouTube marketing videos have been recorded on the iPhone. So if you need a one-in-all gadget that’ll help you communicate while enabling you to create cool videos, consider getting an iPhone 6. Using your iPhone to record your videos? This is your ideal microphone tool. The Movo PM10 Deluxe Lavalier is a condenser Microphone that works with the iPhone, iPod Touch, iPad, Windows and Android smartphones. Also comes with a 1 year warranty, a Wind Muff & Lapel Clip. Your in-built iPhone mic might not produce that ultimate voice you’re cultivating for your next video! This accessory increases the effective sensitivity you get with the default iPhone mic by reducing unwanted back and side noise. You can adjust the volume with real time monitoring using the MoviePro Video App on your smartphone. It will work with the iPhone, iPod Touch and iPad. Take your video production to the next level with a Pro Canon DSLR camera. Canon’s innovative technology, brilliant design and world-class optics can help you create better-quality videos. Whether you’re a beginner or a Pro video maker, a Canon is an effective video marketing tool! An incredible sound quality Mic that works with all your camcorders and HDSLR audio recording. It’s portable and top quality! This omnidirectional self-powered condenser microphone is best suited for webcasting, wedding recordings, school cases, entertainment and education. A tripod is a must-have tool for video marketers. Whether you’re using a tripod for your mobile phone or your DSLR, a lightweight and compact design that makes it possible for you to capture steady and focused footage. Wistia provides professional video hosting with analytics and scores of video marketing tools. Think of Wistia as a smaller YouTube that’s dedicated specifically for business use. You can use this tool to increase leads and enhance focus in your content. With the email collectors, calls to action, viewing trends and video heatmaps, you have all the tools you need to leverage the power of video in your marketing. If you didn’t watch videos on YouTube, you probably watched them on Vimeo. Vimeo is an increasingly popular video hosting platform that allows you to upload content, share it with the world, and connect with your audience. You want to make sure that your videos get to as many people as possible, and that means you should seriously consider posting them to Vimeo. YouTube is the worlds most popular video search engine (and it’s the #2 search engine in the world, behind Google). Once you’ve made that perfect video that you know will appeal to your audience, YouTube is where you post it. You can cultivate an audience and make a profit on YouTube. Keep it in mind that when it comes to using videos on YouTube, quality is paramount. Focus on producing content that meets your audience’s needs! YouTube Analytics is an incredible video marketing tool that provides a wealth of data, metrics and trends on how your content is doing on YouTube. Use YouTube Analytics to make your content truly viral. Leverage these video marketing tools to revamp your marketing campaigns, put forward your best content and make sure it’s targeted for the right people. This ensures your business gets maximum engagement and exposure from the most successful type of advertising – video marketing. YouTube Analytics gives you bankable trends in your video content. Like generating lists of popular keywords to leverage YouTube SEO, YouTube analytics is that little bit of extra data that can help you discover what your audience wants from you. If you’re reading this, you’re either using YouTube to share your video content, or your planning to start in the near future. You can generate explosive YouTube results by leveraging 6 YouTube Analytics secrets that are hiding in plain sight. When it comes to video marketing, quality and engagement are the name of the game. You have to provide your viewers with specific and relevant content to get them to take action. That’s the golden rule, so keep it in mind. But if you are looking to leverage the real power of viral video content, you’re going to have to do a lot more to make your videos more appealing and sharable to a massive audience pool. Good thing is that you have everything you need right under your nose, from the YouTube Analytics tools to the optimization tips we offer in this useful blog post (truthfully, we should be charging for it). After you upload your videos, you’ll want to know who’s watching them, and how you can increase your views. That’s where YouTube Analytics gives you a serious advantage. To get started, sign in to your Google account and click on your Channel icon in the top right corner. From there, click “Creator Studio” and then you’ll see the “Analytics” tab on the left-hand column. At 7 Figure Automation, we like to think of the YouTube Analytics dashboard as a vault of valuable information telling us how to improve both performance and engagement. Hit on ‘overview’ for a quick view of your channel performance. Channel Performance should always be your top priority. You want to make sure that you’re getting as much engagement from YouTube as you possibly can. For that to happen, your channel needs lots of traffic, subscribers, and you need to be monetizing your content. Lucky for you, this is easily doable. The YouTube analytics app provides a number of important metrics that can help you gauge and optimize your channel performance starting RIGHT NOW. Views are the total number video views between all YouTube videos in your Channel. This tells you how many people clicked on a link that started playing your video. You can pick up data on how several of your videos are performing from this YouTube analytics record. Which videos have the largest percentage of your total views? Pro Tip: segment your videos into playlists that are organized by topic. Evaluate each playlist’s total views to discover which content is most popular. Estimated Minutes Watched are the total number of minutes watched between all YouTube Videos in your Channel. Getting a high number of views is great, YouTube ranks videos according to their total Views and Estimated Minutes Watched combined. Be sure to consider these factors when producing your video content. If people are spending a lot of time on your content, you’re doing it right. If not, you’ll need to access your content and do something to make your content better and more relevant. The engagement reports scores the activity that drive’s your channel’s popularity. High engagement activity is a great indicator that your content is doing well. You’ll definitely feel a sense of accomplishment if a lot of people are sharing, clicking on your links, annotations and other calls to actions in your video content. The Likes and Dislikes Report shows you the number of people who have liked and disliked your videos. It shows you the total change in likes/dislikes for your videos and adds up the total. The number of likes/dislikes lets you know how people are responding to your YouTube videos, whether positively or negatively…helping you understand which videos are attracting and engaging your audience the most. The most entertaining or inspiring videos tend to get the highest numbers of likes. Product promotion videos, educational content and advertisements on the other hand tend to attract fewer likes. Think about this in your YouTube strategy. Pro Tip: encourage your viewers to comment and like your videos! The Comments report shows you the number of people commenting on your videos. Use comments to see what people think about your videos. Comments are also a superb way to interact with your viewers. Make sure to reply fast and address questions or criticism professionally. The more shares your videos are getting, the better for your YouTube video marketing campaign. Invest the time to produce high quality videos and optimize them using YouTube SEO strategies to put your videos in front of the right audience! The Videos In Playlists report shows you the number of times your videos were added/removed from a viewers’ playlist (e.g. Watch Later, Favorites, or a custom playlist). Grouping videos in playlists helps get more views from related content. And people are more likely to watch a similar video at the end of each first video they view. See how engaging your playlist content is – this can provide incredible tips for optimization or reorganization. The Subscribers report shows you how many subscribers have been gained or lost for your channel. Subscribers receive emails each time you post new content, so they tend to be more engaged with your content and watch your videos on a regular basis. This YouTube Analytics report can help you discover what videos are generating the majority of your subscribers. Think about what people are searching for in your niche and find those essential keywords. Be sure visit our helpful post on how to get free YouTube leads and create a profitable channel. The Top 10 Videos report shows your channel’s top 10 videos with the most views. If a video is attracting as much attention as needed to rank at the top, then it’s definitely got something your audience loves. Analyze it and try to figure out what this is. Look at the thumbnails, annotations, descriptions, title and tags. Find that secret that makes this video a top-performer and replicate the same in all your future content. The Demographics report shows you the age range and gender segmentation of your audience. So, if you’re selling a product or service that applies to specific demographics, then you want to make your content is optimized for this group. Pro Tip: select “Show only subscriber views” to see the demographics of the subscribers who are viewing your content. YouTube is the second biggest search engine in the world after Google. YouTube makes it easy for website and blog owners to embed your video in their content. Better still, you can find where your traffic is coming from so as to do your YouTube Search Engine Optimization accordingly. The playback locations report gives you an overview of how many views you’ve gotten so far per location. There are several playback locations listed, including mobile devices, YouTube watch page, embedded player on other website, YouTube channel page and ‘YouTube other’. This helps you determine whether you need to spend more of your efforts on YouTube SEO, or encouraging sharing and embedding to external websites. Consider sharing your videos via email newsletters, social media channels and other communication outlets that your business often uses. You can track the performance of your efforts progressively to see what works best for you. If you run ads on YouTube, you’ll want to figure out exactly how your money is working for you – to maximize leads and sales. Lack of monitoring is one of the biggest mistakes you can make with paid advertising. Use YouTube analytics to refine your marketing message. Information on what videos are getting the most attention from viewers helps you plan and create the kind of content your viewers anticipate. The Annotation report provides info about your video annotations performance of and gives engagement info such as click-through rate and close rate for annotations on your videos. Impressions: The number of times your annotation was displayed. Clicks: The number of clicks on your annotations. Click-Through Rate: The percentage of clickable annotations that received clicks. Close Rate: The percentage of your annotation impressions that were closed by a viewer. You can access the Annotations report by clicking the Annotations tab on the left hand menu in your YouTube Analytics dashboard. The Cards report gives you info about how your viewers are interacting with Cards on videos on different devices (desktop, tablet, and mobile). You can access your Cards report by clicking the Cards section in the left-hand menu in YouTube Analytics. And you can select to see cards data by Channel, Video, Card Type, Individual Card, Geography, and Date. Card teaser impressions: The number of times card teasers are shown. Teasers can have multiple impressions per view. Card teaser clicks: The number of clicks on a card teaser. Card icon clicks get attributed to the last teaser shown. Card teaser CTR: The click-through-rate of card teasers, which is the ratio of teaser clicks to teaser impressions. Card impressions: The number of times a card was shown. A card impression is recorded for each card on a video when the card panel is opened. Card clicks: The number of clicks for a specific card. Card CTR: The click-through-rate of cards, which is the ratio of cards clicks to card impressions. Advertising Analytics tell you how well your paid advertising is performing. Be sure to learn about the 4 types of YouTube ads and when to use them. The wealth of data you gather on demographics, engagement and performance helps you create powerful ads that are likely to get better results. YouTube Analytics holds a gold mine of information for your video marketing campaigns. If you get good at interpreting the data and taking positive action, you can use it to generate traffic at a profit. YouTube ads are THE most powerful type of advertising. The combination of video marketing with Google’s search engine gives you incredible leverage when attracting more traffic, leads, and sales online. Video is the best way to capture a person’s attention and influence their emotions. Marketers who are using YouTube video advertising effectively see a 20% increase in website traffic (conservatively). And if you’re combining that with YouTube SEO (Search Engine Optimization) then you’re going to see even better results. This post guides you through the 4 types of YouTube ads that quickly boost revenue and when to use them. Is increasing leads and multiplying revenue your BIGGEST business goal? You’ll just need to give it a little more work to make your campaigns perform well against your competition. So optimizing your video ads is key. Your Call-To-Actions’ should be so awesome that people want to click. For example – if you’re promoting a fitness video, consider taking your shirt off. It’s all about the visual! Refer to your buyer persona to see what targeting options work best for your niche, products or services. Different imagery works for different images. Invest the time to find out what visual cues really rock in your industry, and then use them effectively to attract viewers to your video ads. Once you’ve done that, it’s time that you understand the different types of YouTube ads and how you can use them. Skippable Video Ads are designed to attract the attention of your prospects in the first five seconds of watching the ad. Skippable video ads allow viewers to skip ads after 5 seconds, if they choose. And they can appear before, during, or after the main video. These types of YouTube ads are also referred to as TrueView In-Stream Ads. After this brief moment, users have the option to either continue watching your ad, or click a ‘Skip Ad’ button to proceed watching their initially selected video. Skippable Video Ads are a great way to increase visibility on a Cost Per View basis. How much you pay depends on how specific your targeting is. One of the best things about Skippable Video Ads is that YouTube won’t charge you until the ad has been watched for minimum 30 seconds. This YouTube ad type allows you to do something truly awesome – interrupt the viewer’s attention and force him or her to focus on your pitch. After ‘forcing’ their attention, the viewer is then given the option to skip the ad. Skippable Video Ads often contain links that take a viewer to a landing page – e.g. early bird pricing offer page. So, when should you go for the in-stream type of YouTube ads? If you are looking for more impressions, this might be the best type of YouTube ads for you. Your ability to get leads before they skip your ads depends on whether or not you can create a killer script to grab the viewer by the collar within the first 5 seconds. Remember that viewers have a short attention span. Capitalize on that first 5 seconds to get the best results with your video marketing campaign. Keep it short and to the point. At 7 Figure Automation, we like it around 30 seconds and no longer than 60 seconds. Are watching videos on particular YouTube channels. These are similar to the video ads mentioned above but are not skippable. These types of YouTube ads are also known as Non-Skippable In-Stream Ads. Non-Skippable Video Ads must be watched before your video can be viewed. And long Non-Skippable ads may be up to 30 seconds long. Keep it in mind that the shorter the better. Few people are actually going to spend an entire 60 seconds watching a compulsory ad! Quality is paramount – never forget that! Non-Skippable YouTube Ads can show any time; before, during or after a video. Viewers will not be allowed to watch the originally selected video until they have viewed the entire advertisement. However, if you’re not confident you can pull this off for now, consider staying away from non skippable ad types until such a time when you can make the ad content really irresistible. YouTube Display Ads appear to the right of the feature video and at the top right of the YouTube Search Engine Results Page. For larger players these ads may appear below the player. Display Ads are meant to capture the user’s attention while they’re watching other videos. YouTube used to highlight these ad types with a yellow border, but that’s no longer the case. That means your ads are now blended with other organic listings, which is a good thing for you! Don’t use Display Ads to direct viewers to your landing page. Instead, use them to drive them to more of your content. But make sure that your ad thumbnail rocks, otherwise you’re going to have a problem getting people to click! YouTube Display Ads are a great way to increase your YouTube subscribers, or get more views to your content. If you want to use Display Ads to take users to your website, build calls to action into your video content. You should include links in your video descriptions as well as clickable YouTube Annotations. YouTube Overlay Ads are semi-transparent display ads that appear on the lower 20% portion of your video. These types of YouTube ads are also known as YouTube In-Video Overlay Ads. Linking your Call-To-Action Overlay Ad to your landing page gives you the highest chance of lead conversion. The great part about these ad types is that you can advertise your company’s products inside the video of your competitor’s video. Allowing them to do all the work for you – and you to benefit from the situation. As a rule of the thumb, your landing page should be congruent with your ad, so you can preserve the ‘scent’ of the ad and keep viewers hooked. YouTube Overlay Ads are great if you’re looking to get more views without causing interruptions. Be sure to see how HubSpot illustrates the use of this YouTube ad type to accomplish lead generation objectives. 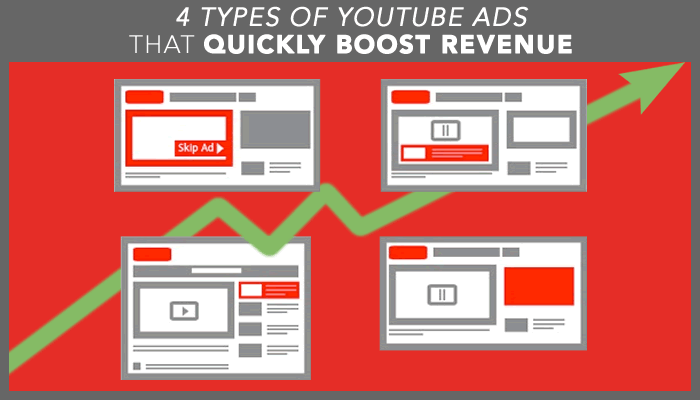 Now you understand the 4 types of YouTube ads that quickly boost revenue. Test and use each one to see which one works best for your business. Whatever types of YouTube ads you choose to use, the importance of a well-defined call to action cannot be understated. If you are working with in-search or in-display ads, make the thumbnail enticing. A strong headline also works wonders. Think about what you want to achieve when people click on the ad. Make sure that everything about the ad helps accomplish this goal. And lastly, be sure to combine these 4 types of YouTube ads with YouTube SEO strategies to monetize your video marketing efforts. Video marketing is the most successfully used marketing tool today. And YouTube is WITHOUT a doubt the most robust video marketing resource. It’s currently the second most used search engine in the world (behind Google). There are a dozens things you can do for your business on YouTube, such as present your products, introduce your team, highlight your mission, and many more. If you know how to press the right buttons, YouTube can be a surefire way to fuel the success of your business. Just imagine what your company would be like if you had thousands of leads joining your email list from YouTube automatically! Sure the BBC (Big Business Club) has lots of money to dump into marketing…but your small business is looking for creative, low-budget options to find valuable leads. So if that’s you read on. It takes less time to create your YouTube channel than it does to make breakfast in the morning. But you’ll need some more time to polish it up! By default, your channel’s landing page will appear simple. So, take advantage of the features YouTube provides to optimize your viewers’ experience. Your goal is to get as many free leads as possible from YouTube…so make your channel content so good that you could charge for it. BUT a trailer is not a must-have, so don’t get a headache if you don’t already have one. Branding is also an important way to make your YouTube channel great. Consider customizing your background. You also want to showcase your social profiles, and create a custom header. Unless you’re an NGO, this will come at a cost, but it is a cool way to add appeal to your channel. A few great resources for getting YouTube channel art made are Fiverr, 99designs, or Canva if you want to do it yourself. The Chinese say that a journey of a thousand miles starts with a single step. When it comes to YouTube marketing, keyword research isn’t just the first step…it’s an important one that can help you take a serious shortcut to success. If you don’t put the hard work in now to discover which prospects will be most responsive to your marketing efforts, you’ll end up spending more money to acquire leads and going over budget. Here at 7 Figure Automation we use the Google Adwords Keyword Planner to generate a list of popular keywords. Next, remove the ‘how to’ and other words that aren’t directly associated with the ‘keyword’. Then use the keyword planner results to find more search terms out of each of these keywords. To see an expert in action, checkout how DigitalMarketer.com uses this keyword research to create highly ranking videos in the Basketball niche. Once you’ve created a list of solid keywords, the next step is to create your video content. It’s very important that you focus on just ONE specific need in each video. Whether you’re using screen-recording tools like Camtasia and Screenflow, or actually filming yourself – the videos you create must be ULTRA SPECIFIC. Before 2014, YouTube ranked videos that simply had a lot of views over a short period of time at the top. But as their algorithm has become more complex, the emphasis is now on quality and engagement. So, as long as you’re creating valuable, engaging, ultra specific video content that people watch all the way through, you have a shot at the top spot. Make your videos as long as they need to be to offer value to viewers without losing their attention during the video. And keep in mind that shorter videos perform better than long ones. But don’t get ahead of yourself with video editing. Some of the best YouTube videos were actually shot on a smartphone! Simply take massive imperfect-action, put a result out there, and let the market tell you what adjustments to make. To keep viewers coming in and score free leads with YouTube, you need to cultivate consistency. If you decide to publish a video every week, make sure you do so. If it’s 4 videos per week, keep it up. Find a schedule that’s realistic you can stick to. Your primary goal is to score free leads with YouTube. This can only happen when you’re publishing content consistently and getting lots of traffic and views. Remember the keyword research we did earlier? Well, this is your chance to use it to make sure you’re putting the right message in front of the right people. It’s that little bit of extra work that’s going to give you the edge over your competition….because optimization is key. Metadata are the descriptions you enter about your video to help YouTube’s search engine understand your video’s subject. This includes the title, description and tags. Optimizing your metadata helps rank your Video both on YouTube and Google. Optimize the Title – ideally, your Title should be descriptive, short and to the point. The title carries a lot of weight. Make it natural and clean, but don’t just overdo it with keywords. The YouTube keyword suggestion tool is a great way to find good ideas for your video title. This tool gives you an estimation of how much traffic a key phrase is likely to have, so take advantage of this. And make sure to choose ‘exact match’ when using this tool. Pick a title that lets the viewer know that the video addresses their needs! Optimize the Description – write a lengthy description of what the video content is all about. Always include a relevant URL to your website at the beginning of your description. You want viewers to find corresponding info from your video on the company’s site. After the URL, bring in your most significant keywords within the first couple of sentences. Aim at least 250 words long video description using the right keywords for the title and the video. Optimize the Tags – Most YouTube marketers don’t use tags the right way. Just promptly inserting 3 or so tags won’t be ideal. Include 10-20 tags per video, using relevant keywords (words or phrases). Think about what phrases or words users might use to find such a video. In this case, it helps to pay your keyword list another visit. You have seen a lot of repetition in the last few paragraphs, but I want to make the word ‘optimize’ to stick with you. Optimizing your Video title, description and tags helps YouTube and Google’s algorithm find your content for what it is. For more experts in action, checkout KissMetric’s Post on how various companies have optimized their YouTube video channels for better results. Playlists are a descriptive feature that allows you to organize your videos into groups based on a topic of your choice. This is a great way to group similar videos together – making your channel better organized and more meaningful. A viewer is more likely to watch a video of the same topic right after, so playlists help increase traffic from related videos. Create keyword focused titles for your playlists. Provide a correct description for the playlist. You can insert as many as 5000 words for the description, but you really don’t need it that long. YouTube cards allow you to add strategic Call-To-Action links to your videos. These cards convert viewers into leads by taking them to your Landing Page where they can opt-in to email list. Put your call to action here – ask viewers to subscribe to your channel for free training, join a list to get a free gift, or comment on your videos for expert courses and free premium resources! YouTube cards are like clickable display advertisements. You can use them to generate leads, get more social followers and direct people to your website (you’ll need to add an associated website through your “Creative Studio” to enable this). Show cards only in the first 10% and the last 10% of the video! Only use one card at a time. Don’t tell people to do many things at once! Don’t bombard viewers with all of your content. Most likely, not all of it will be interesting to them. Make a point to only showcase the best about your business on your channel. Don’t shuffle consumer content with corporate content. Use playlists to make groups of related videos. Don’t order your videos by popularity. Focus on pushing the kind of content that’s currently most relevant to your business. Relevance is more important than popularity. Start applying these tips to INSTANTLY boost your YouTube marketing results. And make sure to focus each video on one specific topic. If your content is well researched, relevant and succinct it will go a long way to earning engagement from your viewers. Aim to create valuable video content and stick to a consistent schedule. It will go a long way to creating a profitable community on YouTube. Spending hours creating the perfect landing page only to see sub-par conversions can be quite frustrating. It seems like all your competitors are consistently generating new leads and making tons of money. Their landing pages don’t seem much different than yours, yet they’re exceeding a 40% opt-in rate. You’re starting to get overwhelmed. You’re delivering useful, engaging content, and you’re getting positive feedback on your lead magnet. But you can’t seem to get anywhere close to a 40% opt-in rate. At this point, you’re starting to wonder if you have bad luck or something. Personally, it took me quite a long time to crack the landing page code. I spend hundreds of hours and thousands of dollars finding strategies that actually worked. To save you time (and money!) I’ve put together the top 7 elements that had the greatest impact on my traffic and conversions. This step-by-step guide breaks down the entire optimization process into the 7 most valuable elements of any landing page. Your headline should be clear, concise, and benefit-driven. Avoid technical or unnecessary words. You will want to reach your customers in a deep and emotional way. Use this free headline analyzer to determine your headline’s Emotional Marketing Value (EMV) score. Most themes use big images for background filler. This is a bad choice because they slow down the load time (lowering conversions) and take away valuable space. And after reviewing many split tests, it’s no surprise that the plain and ugly landing pages always win. Clean & Simple: 5 – Colorful & Busy: 0. Pictures tell the story. But, your graphic must be professional looking to boost conversions. For professional and inexpensive designs – checkout Fiverr. The two-step optin button usually has something like “download now” or “get instant access!” as opposed to having a form on the page. The two-step optin flies under the radar because it doesn’t appear that you’re asking for something and it adds a micro-commitment before the big commitment to give you their email. Most of your visitors won’t scroll below the fold. Make sure that your two-step optin button appears on the landing page, without having to scroll. And if you have a long-form landing page – make sure to put another optin button at the bottom. The text and imagery on your landing page should match the text and imagery that was shown in whatever ad or creative that brought your visitor to your landing page. In addition, you should explain EXACTLY what they’re getting (e.g. “Discover 5 ways to find your audience’s interests and generate a limitless supply of inexpensive traffic”). Retargeting is essential to getting your conversions above 40%. Most of the time your visitors will get distracted and forget to take you up on your offer. Retargeting Pixels are pieces of code that are placed in the header or footer of your website (and hidden in the background). They place anonymous retargeting “cookies” in a visitor’s browser. This allows you to display follow-up ads across the web and on Facebook. Use these 7 elements to reduce your traffic costs and boost conversions more efficiently. And remember…there’s always another conversion percentage point to be squeezed out of your visitors.